This is the actual disc that this review is based on. Whoa. Amazing. For those of us with no attention span and just want to know how the “Lace” flies, just skip to the last paragraph. I’m about to get wordy… Since it is currently mid November of 2012, and the Vibram Lace isn’t due to sell in stores until late November, it seems wise to characterize this as a “pre-release disc review” for a couple reasons. 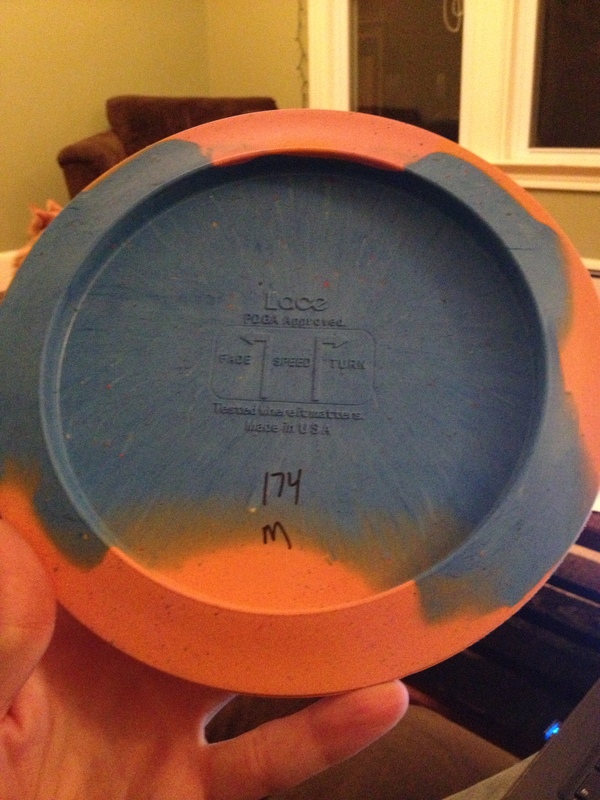 First, and most importantly, I only had one sample disc to test (my sample is a 174g Medium). Secondly, I have only thrown the Lace 50 to 60 times. With that disclaimer aside, let’s get into what the Lace is all about. I don’t think the Vibram Lace will invoke a similar confusing conversation. So congrats Vibram! Let me just take one moment to voice a single complaint about most Vibram discs: the colors. It is a personal preference thing, so I may be a minority. However, their marble-like color schemes are impossible to find when thrown in the woods. It’s the same as with tie-dyed discs. While the colors used (orange, blue and red) might be bright on their own, when you mix them together on the same disc, it’s like camouflage. I once saw a poor guy buy a dark brown/green Vibram disc at a tournament and lose it on his second throw. 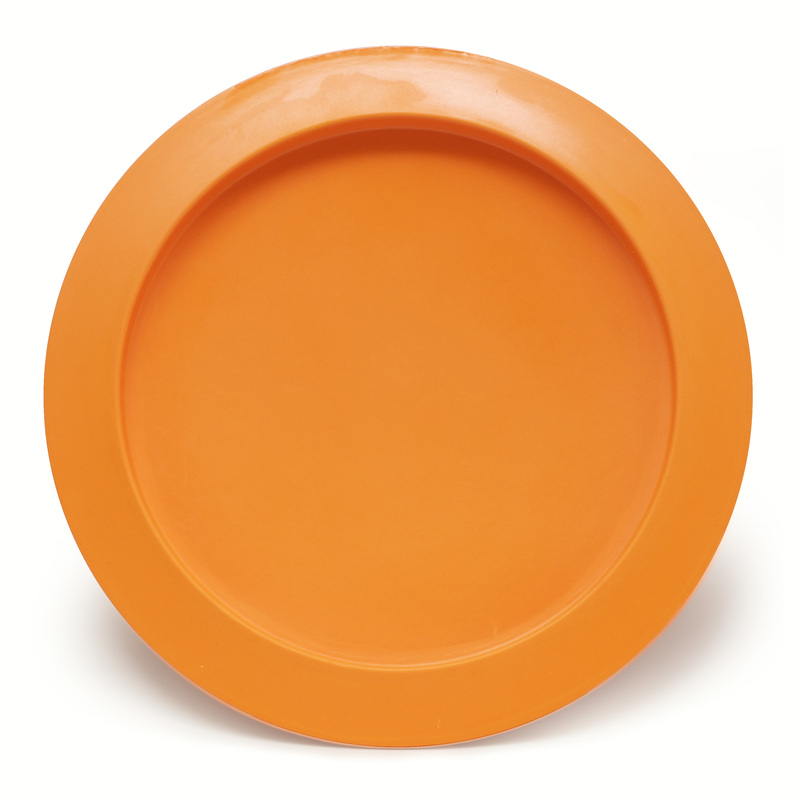 What is the objection to making a simple disc that is RED or BLUE or ORANGE? I’ve seen a few solid colored Vibram discs, but they are usually considered rare and collectable (like the solid red VP’s with the yellow Vibram logo). Anyway, that’s just a semi-unrelated rant I had to put out there. The Vibram Disc Golf line uses their own unique way of determining speed, fade and turn numbers, which I am not well versed in. They’re actually very easy to interpret, but since other major disc manufacturers don’t use them (yet? 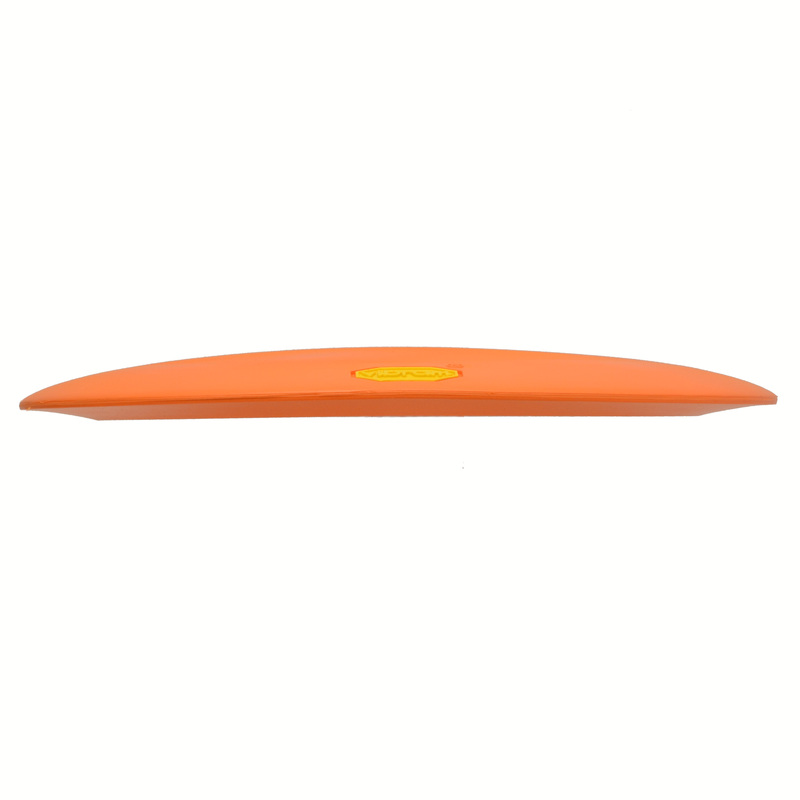 ), it’s difficult to compare with familiar molds. The first disc that I liken the Lace to is the Innova Katana. There are a few reasons for this. After just holding the disc, it’s clear that the rim width and depth are similar to the Katana. The edge is quite sharp, and I’m willing to bet the rim is close to the maximum allowed size. This makes the Lace a very fast disc, which you would probably call a speed 13. On my first half dozen drives, I found the Lace to be too stable to get a decent result. It wasn’t pig-ish or unmanageable, but I threw it with the assumption that it would have some turn before the fade. Apparently it needs more arm speed to invoke a true turn. This doesn’t surprise me, as discs like the Destroyer and Nuke don’t often see time in my bag. They are both great drivers, but I find that they take too long to break in to a useable stability level. I’m more prone to throw a Wraith (speed 11) and a Katana (speed 13, but a bit under-stable). So, if you’re one to throw discs like the Nuke, Destroyer, or even the Hoey Boss (if you don’t know, now you know) or Cannon- I would assume that the Lace is right up your alley. If this isn’t you, I wouldn’t lose hope yet. Moving past those initial throws I tried a few different things with the Lace. In general, I’m not a fan of the large rimmed discs. I don’t throw them very accurately, and they often slip out of my hand mid throw. Discs like the Leopard and Teebird are more my size. So putting that aside, I threw some shots with a whole lotta muscle power. The Lace could handle it. There wasn’t one throw where the disc did a ‘turn and burn’ and headed for the dirt. Admittedly, I never threw it into a direct 20mph headwind (that’s a shot I’d never use a disc like this on anyway) so I’m not sure where the limit is on the stability. At one point however, I was in the open field with a slight tailwind and I threw it max power with a very intentional anhyzer angle. With a release that gave it some height, the disc flew a very long way on the anny angle, but sure enough came back and gave me a total distance of 400+ feet. I wish I had thrown this same shot over the football yard lines because it may have been one of my furthest throws to date. Near the end of the second day of practice throws and real-round throws I decided to try it sidearm. Up to this point I was confident that I wasn’t going to turn it over, so I figured I had nothing to lose. These three to four sidearm drives were actually my favorite throws with the Vibram Lace. I don’t have a rocket for an arm, and sidearms tend to hurt my shoulder (an old baseball injury), but I will say if I throw with control, my flick is good. My first attempt at a flick had the Lace flying straight as a laser for about 300 feet and then it faded into the hillside (hole 17 at Pye Brook Park in Topsfield, MA). This sidearm aspect of the disc is what reminded me of the Katana once again. If you’re familiar with the Pro Katana, this is NOT what I’m talking about. Rather, when you get a new Champion Katana, they are quite stable out of the box and require a lot of arm speed. The Vibram Lace seems very similar. I will say that if you throw a sidearm with all arm (like a football) and rely on the over-stability to compensate for the extreme angle (a lot of beginners throw like this)- this isn’t going to be that sort of disc. The Lace is nothing like a Nuke OS or an Ape. This image was totally from the Vibram Disc Golf web page and stuff. So quit tryin’ to front and enjoy. Trying to wrap this up, I think we’ve covered the most important things. This disc is no push over. It is a true distance driver with a max sized rim. It flies far and stable. Admitting that I don’t have the strongest arm out there (I throw my beat Star Wraith about 330ft. with control), I would venture a guess that Vibram has done an excellent job finding that sweet spot in the speed/stability ratio that offers players a chance to throw really far. It wouldn’t surprise me to see the Lace in a lot of bags this next season- not because it is a ground breaking distance driver. Instead, the grip and durability of Vibram’s rubber combined with the reliable stability of the Lace will give players a confidence to pull this disc out and let it rip- knowing it’s not going to turn over or suddenly get too beat in. I’m curious to know what weights will be offered (I prefer slightly lighter than the 174g version, so that may attribute to my opinion of the stability), and if they will release it in a firm version. In any case, you’ll be seeing this disc a LOT in 2013! This entry was posted in Equipment and Gear and tagged disc, distance, driver, golf, lace, review, vibram. Bookmark the permalink.